We are excited to announce that our founders Natassa Lianou and Ermis Chalvatzis are invited speakers at the prestigious 'Architectural Facade Design' Conference, organized by Elval Colour and EK magazine in Cyprus. They will be presenting the office's unique Architecture and Design philosophy and projects currently under construction. The IFAI INTERNATIONAL OUTSTANDING ACHIEVEMENT AWARD WINNER, INTRALOT ICONIC PAVLION continues its journey with its redesigned version, this February in London, ICE 2018, the biggest Gaming and Betting Expo worldwide. We are extremely happy to announce our creative partnership towards a more Elegant and Stylish World! This year LC Architects team up with Arper to create an elegant and unique VIP Lounge area as part of the INTRALOT ICONIC PAVILION presented at ExCel London this February, as part of Expo ICE 2018. Join us to experience this Inspiring Collaboration!!! We are extremely happy to announce that Natassa Lianou + Ermis Chalvatzis, founders and directors of LC ARCHITECTS designed the GIWA (Greek International Awards) Identity and 'THE RISE' Award Statuette for the big ceremony which will be presented at the British Museum in London on December the 9th. Stay tuned for the big night! ‘The Design of the GIWA Icon Identity and ‘The Rise’ Award Statuette are inspired by the ethereal yet dynamic nature of each and every woman. 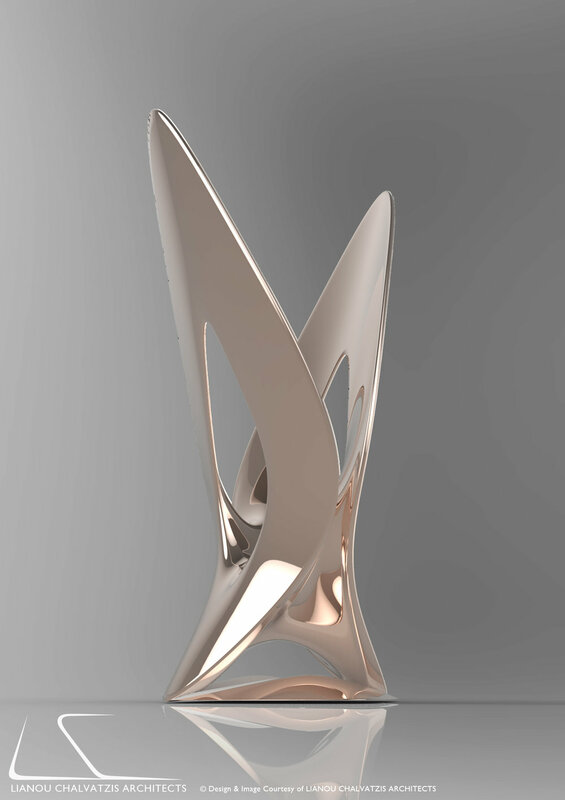 The GIWA Icon and ‘The Rise’ Award, represent a contemporary symbol of the Wings, a timeless and powerful symbol of constant progress and triumph. LC ARCHITECTS have been short-listed at the invited competition for the AMAN SPA in Montenegro in collaboration with EfZin Spa Consultants. LC ARCHITECTS designed a unique interior for the AMAN spa, inspired from Nature and Water. The space depicts an experiential flow where green elements, light and water bring nature inwards, creating a stimulating journey. LC ARCHITECTS are excited to announce that they have been short-listed at the invited competition No8@ARUP 2017, with their proposal 'Luminous Towers'. A big THANK YOU for being one of the most popular among ARUP's engineers votes! No.8@ARUP provides space to host installations and sculptures in Arup’s Central London office. The idea is a simple one, to provide an opportunity and encourage emerging UK architectural practices to showcase their creativity. lead to an exploration of new technologies and techniques; ultimately leading to responsive and clever buildings that serve human wellbeing. 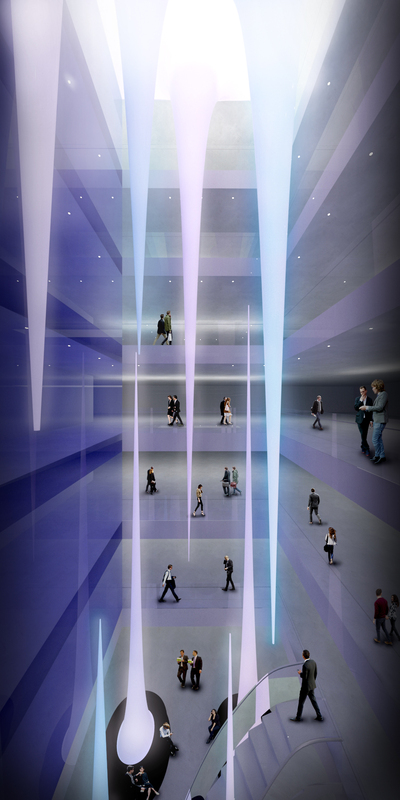 'Luminous Towers' by LC ARCHITECTS, is a system of lightweight funnels bringing light into the main atrium at ARUP’s No8 building in London. The design blends architecture and engineering, through the intelligent use of the material properties in combination with light. London Iconic Pavilion wins the prestigious 2016 Outstanding Achievement Award! WELCOME TO OUR NEW OFFICES IN CENTRAL LONDON!!! Join us in our NEW OFFICES in Newman Street with our London Iconic Pavilion filling in the space of our floor! We are extremely excited about our upcoming ‪#‎TEDxThess16‬ talk and being part of ‪#‎TED‬ culture! Looking forward to seeing you all there on the 2nd of April! Welcome to our London Iconic Pavilion! Thanks to all colleagues, engineers and everyone involved into making our unique design into a real breathtaking living creature! It is just amazing and you all give us so much strength to go on pushing the boundaries of architecture and continue our hard working journey! Join us at ExCel London and enjoy it! London Iconic Pavilion is almost ready! The Celebration Continues at London Iconic Pavilion! Our Iconic Pavilion arrived in London and is On Site! Lianou Chalvatzis Architects and BuroHappold Engineering cordially invite you to the opening of INTRALOT ICONIC PAVILION, on Tuesday 2nd of February 2016 at ExCel London, Pavilion N6-160. We are very excited to announce that Natassa Lianou and Ermis Chalvatzis will give a lecture at the Architectural Association School of Architecture (AA) as part of the 'What's Next' lectures and under the title 'Smart Design Elegance and the Digital Craft'! Natassa & Ermis will present their ongoing projects and talk about their philosophy. Ermis Chalvatzis and Natassa Lianou are happy to announce that they are invited to give a lecture at Gazi, Athens in the context of Design Lab Lecture Series. Ermis Chalvatzis and Natassa Lianou are invited jurors at the MArch Unit 19 Mid-Term Jury panel at the Bartlett School of Architecture (UCL) in the context of the BECOMING-EVER-DIFFERENT agenda by Mollie Claypool and Manuel Jimenez Garcia. Ermis Chalvatzis and Natassa Lianou were invited critics to a Jury panel for students projects review, at the UCL, The Bartlett School of Architecture at the GAD programme, in the context of the Deep Substances: Computational Multi-Objects agenda.